Baroness Jenny Tonge resigned as Christian Aid (CA) trustee after defending her September comment that "the pro-Israeli lobby has got its grips on the Western world." Tonge was widely seen to reflect the core anti-Israel ideology of CA. In May 2006, she appeared in a joint CA-Palestine Solidarity Campaign in London; and in January 2004, she expressed empathy for Palestinian suicide bombers stating "if I had to live in that situation – and I say that advisedly – I might just consider becoming one [a suicide bomber] myself." Despite this resignation, CA continues its cooperation with Sabeel, its partner Palestinian NG O that leads international church divestment campaigns and uses anti-Semitic imagery to attack Israel. 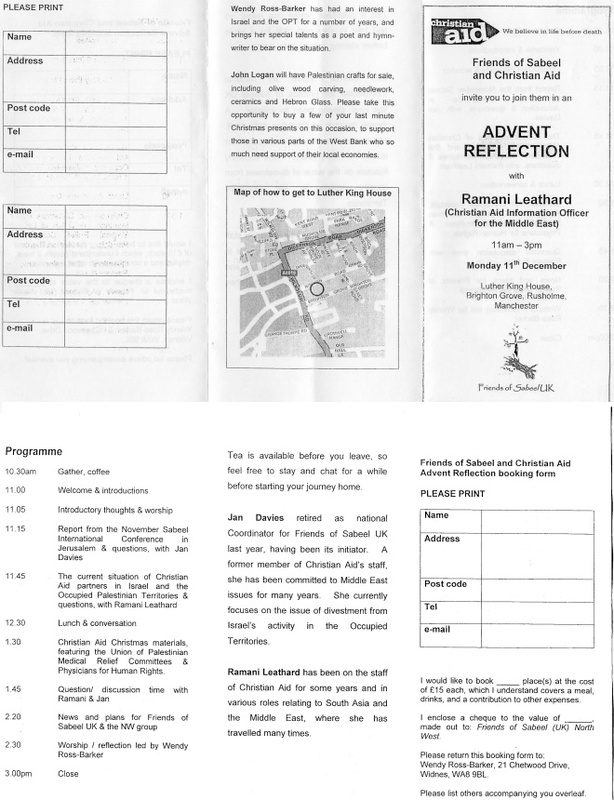 Friends of Sabeel UK’s (FOSUK) October 2006 Newsletter advertised a joint event with Christian Aid Information officer for the Middle East, Ramani Leathard. The event demonstrates the closeness of the two NGOs (also reflected by CA Chair Bishop Gladwin’s post as FOSUK patron): One of the speakers at the event, Jan Davies, was a "former member of Christian Aid’s staff" and the initiator and former national coordinator for FOSUK. The program also included "Christian Aid Christmas materials, featuring the Union of Palestinian Medical Relief Committees and Physicians for Human Rights" — two NGO s with political agendas.